Hunter and Alex are two fitness enthusiasts who saw a brand new unexplored market: fashionable clothing for athletic body types. But with a proposal of $500,000 for 5% equity, will Barbell Apparel be a homerun with the sharks? Growing up, both these athletes had one big struggle: finding clothes that fit their muscular bodies. After realizing that more people had the same struggle, these two friends decided to create Barbell Apparel, whose first fashion line is composed of athletic fit denim, chinos, and shorts tailored to fit muscular legs. And these aren’t just your ordinary trousers! The two entrepreneurs focused on using high-tech fabrics, military-grade stitching, and specific tailor for active bodies. The jeans are actually made up of 100% spandex. During the demonstration portion of the show, it was clear that with Barbell Apparel, there is no movement restriction whatsoever, so you can comfortably show off your great body while maintaining an active lifestyle. The company actually received funding through Kickstarter. Afters setting a goal of $15,000 in 45 days, the entrepreneurs were shocked to find out the morning after posting the funding page, that they had already received $80,000 worth of donations. By the end of the 45-day campaign, Barbell Apparel had received $735,000! The clothes are sold solely online for $149, with a production cost between $15 and $20. Kevin wasted no time, asking them immediately why they have a valuation of $10 million. The young entrepreneurs seemed quite ready to justify their valuation, claiming that by the end of the year, the sales will be $2.3 million, with a growth rate of around 100% per year. This was not enough of a justification for Kevin, who still thought the valuation was too high. Next up, the two entrepreneurs also referred that, although most denim companies make around 15% pre-tax, Barbell Apparel has better margins, since last year they made a gross profit of $700,000 out of the $1.1 million in sales, and out of this year’s $2.3 million, they expect at least $1.5 million in gross profit. They also mentioned that these values were obtained before deducting Alex’s and Hunter’s salary. As the company starts to sound better and better, Lori enquires them about their inventory problem. The entrepreneurs explained that since the clothes are sold at such a fast pace, the company doesn’t have money to invest back in materials. This is the main reason why they came on the show, to find a shark to help them find a solution for their lack of inventory. Robert was the first one to express his concern regarding a possible investment. He claimed that a management of inventory is quite tough, and it requires a continuous cash input. At a ten million valuation, Robert said it’s too much of a risk to invest in the company. Kevin quickly followed, saying that the best option for the company would be if they would manage to get a private equity firm to invest free money at five-million valuation. Daymond, who is a seasoned fashion mogul, was the next one to offer some advice. He mentioned that, although he has 15 clothing brands, 12 of them are dead. He then mentioned that he currently only invests in clothing companies if they are within the sports and athleticism category, but not companies selling denim. The issue with denim is that it lasts long and the more worn it looks, the better it looks. And for these reasons, Daymond backed out of the deal. After Daymond backed out, Mark mentioned that his problem with denim was quite different: market competitivity. If the company succeeds, there will surely be a copycat version of Barbell Apparel, therefore undermining the company. And for that reason, Mark decided not to invest. Lori soon followed, congratulating the young businessmen on their ability to make room for themselves within the clothing industry. Although her praises, Lori doesn’t see this opportunity as the right investment for her and quickly dropped out of the race. Robert’s fears of investing in the company reside within the inventory. As mentioned before, inventory management is highly expensive, so he backed out. In a last attempt to lure Robert back into the deal, Hunter mentioned that they are great at sourcing and managing inventory, the only problem is having enough money upfront to buy the materials needed. Kevin was the last shark still in the game. He praised them for being able to create a business in such a competitive market, but once again the continuous amounts of money needed were mentioned, thus leading Kevin to also pass on this investment. Although no deal was made, the overall tone of appraisal from the knowledgeable sharks means one thing: Barbell Apparel is an excellent company who managed to thrive in a brutal market. 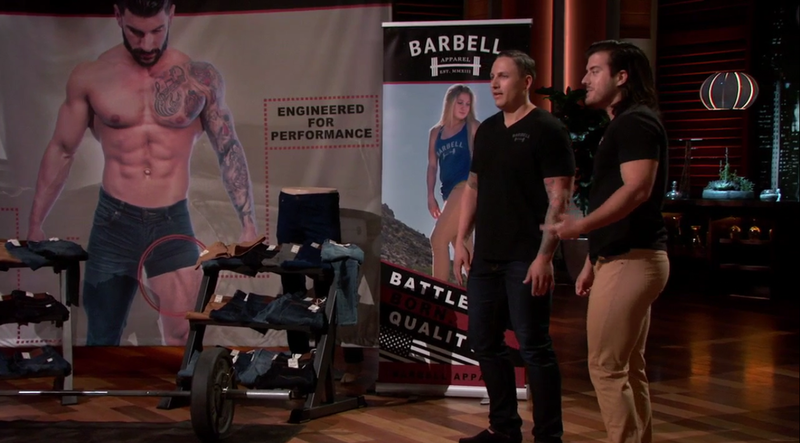 What happened to Barbell Apparel after Shark Tank? Unfortunately, the company left the show with no investment, and though it’s too soon to discuss how the company is doing, we are quite sure that the two entrepreneurs will find a way to keep thriving. If you would like to buy your own active-wear from Barbell Apparel, make sure to visit their website or purchase it online.